2017 Trainee Ecologist positions - applications now open! Applications for the 2017 training programme are now open! The deadline for applications is 5pm on the 10th February 2017. 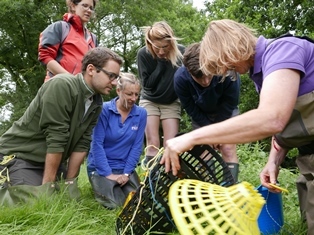 Are you looking for a way into a career in ecology and conservation? The Blackdown Hills Natural Futures (BHNF) Project is offering three positions to ambitious Trainee Ecologists looking for a way into employment in the sector. The training scheme is timetabled to provide a wide variety of directly employable experience, the core emphasis of the programme being on building skills requested by employers in the sector. This includes training in protected species skills central to the ecological consultancy industry, but also training in habitat and botanical survey skills used by government agencies and land managers. You can read about the wide range of training and experience our previous Trainee Ecologists have benefited from on their monthly news blogs. Watch the video below to see some of the highlights from the last two years training programme. To apply please download a job description here, and application form here.